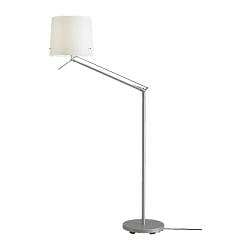 We needed a floor lamp to reach over a sofa. Artemide inflates their Tolomeo design (1989) to make a Mega version for a reasonable $500. But unlike their killer Tizio (1972, by Richard Sapper), I've always felt the Tolomeo poorly engineered and not especially attractive. Similarly, Flos inflates the Archimoon by Philippe S+arck to make the Superarchimoon. Limn has it on display, it's better constructed than the Tolomeo but costs $7000. And again Anglepoise inflates their eponymous Anglepoise, but it's not readily available in the USA. Flos also makes the classic Arco lamp (1962, by Achille Castiglioni) with a shade on a curve for $2500 but that's real Carrara marble. Nice, but too 60s white shag rug conversation pit, and our living room has a low-ish ceiling. You can buy knockoffs of this for less. As I bitched elsewhere, all of these use crappy wasteful incandescent bulbs. They're playing with scale but there's no re-engineering of the light source. We finally found Samtid at IKEA. $34.99 plus CFL bulb. Sold! eco: where are the brilliant LED lamp designs? Went to Design Within Reach looking for some lamps. They have lots of OK "mid-century" designs for lamps, but almost every single one is packing a bloody incandescent bulb, one that wastes 95% of its electricity as heat. Have they not learned about compact fluorescents? Go to IKEA and every lamp has a CFL. What's worse, is where are the LED lamps with brightness adjustability, color mixing, and amazing new forms that take advantage of the featherweight of LEDs? DWR only had two LED lamps, they should have dozens. There's more technology in a $35 Black Diamond LED headlamp for the outdoors than in any lamp in the entire store. Pathetic! I guess "designers" only know how to mount a conventional bulb socket onto their creations. Actually mastering LED circuitry and electronic controls is too hard for them. As I said before, Design without engineering is bad design, and there's a lot of it out there. Perfection has been achieved in faucet handle ergonomics: the Chicago Faucet blade-style taps that you see in hospitals and bathrooms for the disabled improved accessibility. But they aren't especially modern. I knew of Dornbracht , their contemporary classic is the Tara line with cross-shaped handles. But the cross shape looks uncomfortable and is unreadable — you can't tell if the faucet is on or off. They look good even when the taps aren't aligned perfectly, but that benefits plumbers, not owners. Then I found Dornbracht's Tara Classic, also from Sieger Design but with a single handle. It has some of the ergonomic benefits of a blade handle (you can turn them on and off with your wrists) and a beautiful design. The pulls in the house are satin stainless, but for plumbing we went with chrome because the matching accessories are only available in chrome. Dornbracht has a "platinum matt" finish for handles that is irresistably beautiful even though it doesn't match any other finish in the house. Here they are. In our downstairs guest bathroom Tara Classic wouldn't work as well because the taps are mounted in a mirror, also that floor has a less refined feel. We chose Kohler Stillness instead. The design is OK but lacks the clarity and tactile pleasure of the Tara Classic. You can tell the look of Stillness came first. The Tara Classic is such an obvious design, yet nobody else has come close to it aesthetically. This Grohe Atria is similar but way too fussy, its handle pokes out the other side for no good reason. Delta makes a crazy tap unit with similar handles that looks like a V-twin engine. Dornbracht taps cost hundreds of dollars each, yet the Chinese aren't making cheap knockoffs of them, they're making copies of ugly boring designs.